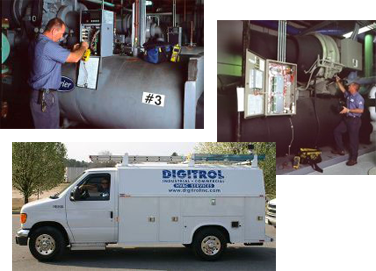 Since 1989, Digitrol has specialized in the heating, ventilation and air conditioning industry. Our team provides 24-hour HVAC service to commercial and industrial companies. Our certified technicians receive factory training from Carrier, Trane, York and other equipment manufacturers. In addition, our company holds Mechanical Contractor Licenses in NC and SC. If you’re looking for a full service provider to design, install, maintain or replace your HVAC equipment, our team is ready to respond to your individual needs.